Organizations store their most valuable and sensitive data in their enterprise database, yet a large number of organizations do not engage in the timely installation of vendor patches after those patches have been released by database management system (DBMS) providers, placing that sensitive data at risk. In fact, a 2010 survey by the Independent Oracle Users Group revealed that of the 430 database administrators, consultants, and developers who were surveyed, only 37 percent installed Oracle Critical Patch Updates within three months of their release. 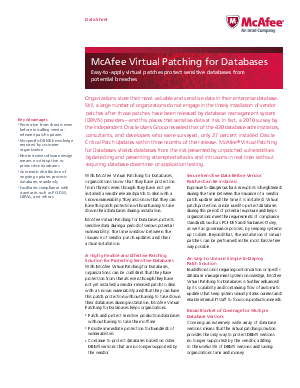 McAfee® Virtual Patching for Databases shields databases from the risk presented by unpatched vulnerabilities by detecting and preventing attempted attacks and intrusions in real time without requiring database downtime or application testing.